If your book appears on this page, and is not by Jean Marcel Bruller, please edit your information to include the author's full name, rather than the surname only. Your book should then appear on the correct author page.Thank you. Vercors was the pseudonym of Jean Marcel Bruller, born in Paris. He attended the École Alsacienne and worked as a graphic artist and engraver until being drafted into the French army at the start of World War II. In 1941, with Pierre de Lescure, he founded Éditions de Minuit, an underground press. He also worked with the French Resistance, passing messages for the British intelligence service. 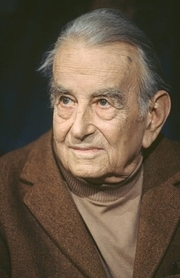 While recuperating from a broken leg, he wrote the novella Le Silence de la Mer (The Silence of the Sea), which Éditions de Minuit published under his Resistance nom de guerre Vercors. Thousands of copies were circulated throughout Occupied France, much to the annoyance of the Nazis -- his editor was arrested and executed. The book was published in the USA in 1943, and by 1948 it had sold more than a million copies in 17 languages. He continued to write fiction, plays, and essays under his real name, but never matched the initial success of Le Silence de la mer. His later works included Le Sable du temps (The Sand of Time, 1946), Plus ou moins homme (More or Less Man, 1950), Sylva (1961), Tendre Naufrage (Tender Castaway, 1974), Les Chevaux du temps (The Horses of Time, 1977), and a collection of memoirs. Vercors is currently considered a "single author." If one or more works are by a distinct, homonymous authors, go ahead and split the author. Vercors is composed of 16 names. You can examine and separate out names.